Minnesota's Kloos is called for holding UW's Frederic. Badgers on their first power play. 9:43 left in the first, no score. 9:43 left in the first and now it's the #Gophers PK's turn. Kloos heading to the box. Kunin hits the post on a rebound scramble. Great puck movement on the power play, but UW can't put one home. Kunin rang one off the post. #Gophers at full strength! 28 PKs in a row. Badger power play expires and we are back to even strength. 7:30 to go. Minnesota kills the penalty and immediately gets an odd-man rush. Jurusik with a fantastic save to keep it out. 10-7 shots for Minnesota now. Will Johnson scores on a beautiful drive to the net. BADGERS GOAL: Will Johnson finishes off a rush up the left wing by going around Schierhorn. 1-0 Badgers with 7:22 left in the first. 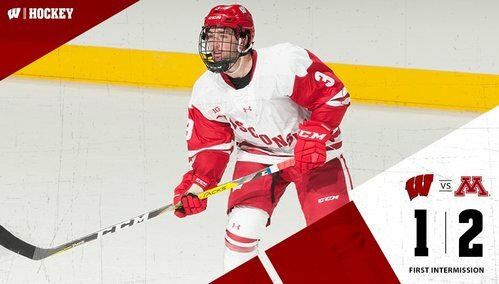 Badgers goal Johnson scores the opening tally with 7:22 left in the first period. Came up the left wing, and beat the goalie on his right with a deke. 1-0 UW just over seven minutes left in the first. Johnson's goal followed a big Jurusik save on Ramsey 10 seconds earlier. Badgers lead Gophers 1-0 with 4:32 left in the first. 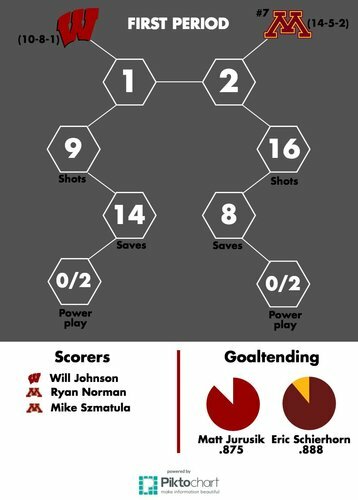 Gophers have 12-8 advantage in shots on goal. Jurusik has made some big stops for UW. Minnesota ties it up on a shot from close range. Minnesota knots the game at 1-1 with 3:22 to go in the first. GOPHERS GOAL: Sustained pressure leads to Ryan Norman tying the game 1-1 with 7:22 left in the first. GOPHERS GOAL: Sustained pressure leads to Ryan Norman tying the game 1-1 with 3:22 left in the first. #Gophers goal! Norman ties it at 1-1 late in the first period with his second of the year. 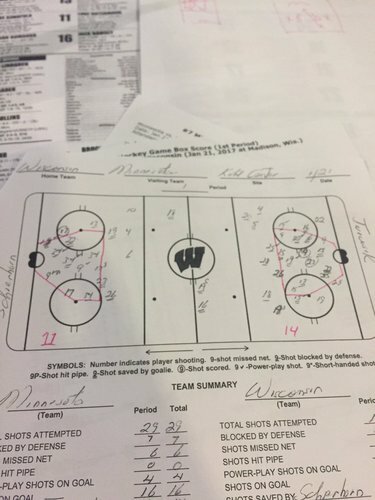 Wisconsin will go on the power play with 2:45 left. 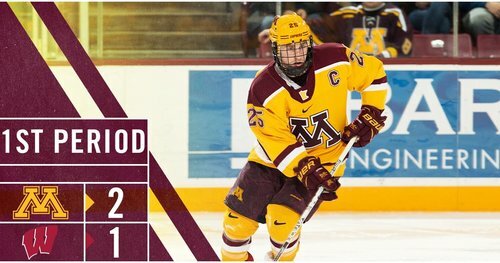 Gophers are whistled for a hooking penalty so UW will have another power play with 2:45 to go in the period. And now Collins will sit for two. Minnesota's Collins is called for hooking. UW gets its second power play with 2:45 left in the first. And the UW power play is nullified. Kunin whistled for hooking four seconds in. But Kunin is caught for hooking just four seconds into the man-advantage so teams will be 4-on-4 for 1:56. Five seconds later, UW's Kunin is called for hooking. 4-on-4. Scratch that...four on four hockey. Minnesota takes a 2-1 lead with 1:51 left in the first. Minnesota takes the lead with another goal by Mike Szmatula - who had one yesterday. 2-1 Gophers. 1:51 left in 1st. GOPHERS GOAL: Gates feeds Szmatula streaking to the net for a 2-1 lead. 1:51 left in the first. #Gophers Goal! Szmatula from Gates and the Gophers are up 2-1. Pretty play by the duo on a 4-on-4. End of the 1st. 2-1 Minnesota. END 1: Minnesota leads Wisconsin 2-1. Badgers came unglued toward the end of the period and Gophers took advantage. Very similar start to yesterday. Jurisik bailed defense out early, but he can't stop every point blank chance. Defensive lapses and defensive zone turnovers plagued #Badgers all period. Came back to bite them at end. Teams are back for the second period with Minnesota holding a 2-1 lead. We are set to begin the second period here at the Kohl Center! #Gophers lead 2-1. Drop the puck!